A height adjustable L shaped desk that is available in two different colors. This desk features a pedestal for all your storage needs, an electric height adjustment mechanism, and is fully reversible. The electric mechanism allows you to quickly and quietly adjust the height of the table from 28″ to 45″. Grommet on the credenza for efficient wire management. Durable 1″ commercial grade work surface with melamine finish that resist scratches, stains and wear. Bestar Bookcase available in many laminate finishes to coordinate with our Bestar discount office furniture. An attractive and supportive Mesh Chair, the 11692B features breathable black mesh back with a leather seat and single position tilt lock with tilt tension adjustment. This chair looks great behind an executive desk or around a conference room table. 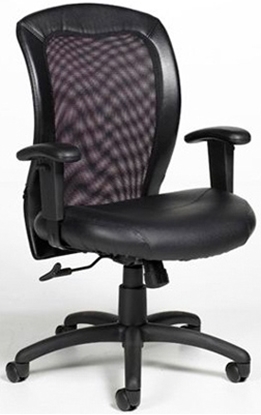 Free shipping on all office furniture. Bestar Connexion includes a durable 1" commercial grade top with melamine finish that resists scratches, stains and burns and deluxe 2.5mm PVC edges. 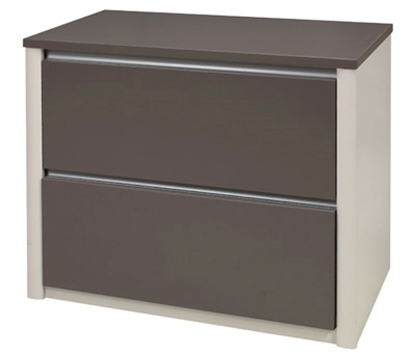 The Connexion 93631 two drawer lateral file cabinet adds a modern style to any office.